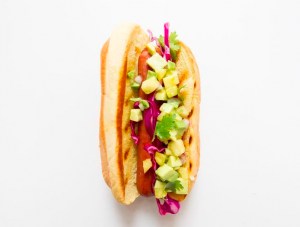 Farm-fresh pineapple, crunchy red cabbage and creamy avocado take your holiday hot dog to the next level. Toss pineapple, avocado, shallot, zest, and juice in a large bowl. Toss cabbage and vinegar in a bowl and let sit for 10-15 minutes. Top hot dog in a bun with pineapple salsa, cabbage, and cilantro leaves. This entry was posted in Latest News, Recipes. Bookmark the permalink.